Snow was born on 15 March 1813 in York, England, the first of nine children born to William and Frances Snow in their North Street home, and was baptised at All Saints' Church, North Street, York. His father was a labourer who worked at a local coal yard, by the Ouse, constantly replenished from the Yorkshire coalfield by barges, but later was a farmer in a small village to the north of York. The neighbourhood was one of the poorest in the city, and was frequently in danger of flooding because of its proximity to the River Ouse. Growing up, Snow experienced unsanitary conditions and contamination in his hometown. Most of the streets were unsanitary and the river was contaminated by runoff water from market squares, cemeteries and sewage. All Saints' Church, North Street, York, where Snow was baptised. From a young age, Snow demonstrated an aptitude for mathematics. In 1827, when he was 14, he obtained a medical apprenticeship with William Hardcastle in the area of Newcastle-upon-Tyne. In 1832, during his time as a surgeon-apothecary apprentice, he encountered a cholera epidemic for the first time in Killingworth, a coal-mining village. Snow treated many victims of the disease thus and gained experience. Additionally, while he was an apprentice, Snow could not drink, gamble or marry. Eventually he adjusted to teetotalism and led a life characterized by abstinence, signing an abstinence pledge in 1835. Snow was also a vegetarian and tried to only drink distilled water that was “pure”. Between 1833 and 1836 Snow worked as an assistant to a colliery surgeon, first in Burnopfield, County Durham, and then in Pateley Bridge, West Riding of Yorkshire. In October 1836 he enrolled at the Hunterian school of medicine on Great Windmill Street, London. In the 1830s, Snow's colleague at the Newcastle Infirmary was surgeon Thomas Michael Greenhow. The surgeons worked together conducting research on England's cholera epidemics, both continuing to do so for many years. In 1837, Snow began working at the Westminster Hospital. Admitted as a member of the Royal College of Surgeons of England on 2 May 1838, he graduated from the University of London in December 1844 and was admitted to the Royal College of Physicians in 1850. 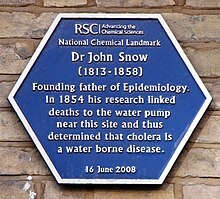 Snow was a founding member of the Epidemiological Society of London which was formed in May 1850 in response to the cholera outbreak of 1849. By 1856, Snow and Greenhow's nephew, Dr. E.H. Greenhow were some of a handful of esteemed medical men of the society who held discussions on this "dreadful scourge, the cholera". John Snow was one of the first physicians to study and calculate dosages for the use of ether and chloroform as surgical anaesthetics, allowing patients to undergo surgical and obstetric procedures without the distress and pain they would otherwise experience. He designed the apparatus to safely administer ether to the patients and also designed a mask to administer chloroform. He personally administered chloroform to Queen Victoria when she gave birth to the last two of her nine children, Leopold in 1853 and Beatrice in 1857 and was still not yet knighted, leading to wider public acceptance of obstetric anaesthesia. Snow published an article on ether in 1847 entitled On the Inhalation of the Vapor of Ether. A longer version entitled On Chloroform and Other Anaesthetics and Their Action and Administration was published posthumously in 1858. After finishing his medical studies in the University of London, he earned his MD in 1844. Snow set up his practice at 54 Frith Street in Soho as a surgeon and general practitioner. 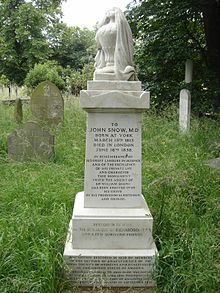 John Snow contributed to a wide range of medical concerns including anaesthesiology. He was a member of the Westminster Medical Society, an organisation dedicated to clinical and scientific demonstrations. Snow gained prestige and recognition all the while being able to experiment and pursue many of his scientific ideas. He was a speaker multiple times at the society’s meetings and he also wrote and published articles. He was especially interested in patients with respiratory diseases and tested his hypothesis through animal studies. In 1841, he wrote, On Asphyxiation, and on the Resuscitation of Still-Born Children, which is an article that discusses his discoveries on the physiology of neonatal respiration, oxygen consumption and the effects of body temperature change. Therefore, his interest in anaesthesia and breathing was evident since 1841 and beginning in 1843, Snow experimented with ether to see its effects on respiration. Only a year after ether was introduced to Britain, in 1847, he published a short work titled, On the Inhalation of the Vapor of Ether, which served as a guide for its use. At the same time, he worked on various papers that reported his clinical experience with anaesthesia, noting reactions, procedures and experiments. Though he thoroughly worked with ether as an anaesthetic, he never attempted to patent it; instead he continued to work and publish written works on his observations and research. Within two years after ether was introduced, Snow was the most accomplished anaesthetist in Britain. London’s principal surgeons suddenly wanted his assistance. John Snow studied chloroform as much as he studied ether, which was introduced in 1847 by James Young Simpson, a Scottish obstetrician. He realised that chloroform was much more potent and required more attention and precision when administering it. Snow first realised this with Hannah Greener, a 15-year-old patient who died on 28 January 1848 after a surgical procedure that required the cutting of her toenail. She was administered chloroform by covering her face with a cloth dipped in the substance. However, she quickly lost pulse and died. After investigating her death and a couple of deaths that followed, he realized that chloroform had to be administered carefully and published his findings in a letter to The Lancet. Snow’s work and findings were related to both anaesthesia and the practice of childbirth. His experience with obstetric patients was extensive and used different substances including ether, amylene and chloroform to treat his patients. However, chloroform was the easiest drug to administer. He treated 77 obstetric patients with chloroform. He would apply the chloroform at the second stage of labour and controlled the amount without completely putting the patients to sleep. Once the patient was delivering the baby, they would only feel the first half of the contraction and be on the border of unconsciousness, but not fully there. Regarding administration of the anaesthetic, Snow believed that it would be safer if another person that was not the surgeon applied it. The use of chloroform as an anaesthetic for childbirth was seen as unethical by many physicians and even the Church of England. However, on 7 April 1853, Queen Victoria asked John Snow to administer chloroform during the delivery of her eighth child. He then repeated the procedure for the delivery of her daughter three years later. Medical and religious acceptance of obstetrical anaesthesia came after in the 19th century. Researchers later discovered that this public well had been dug only 3 feet (0.9 m) from an old cesspit, which had begun to leak faecal bacteria. The cloth nappy of a baby, who had contracted cholera from another source, had been washed into this cesspit. Its opening was originally under a nearby house, which had been rebuilt farther away after a fire. The city had widened the street and the cesspit was lost. It was common at the time to have a cesspit under most homes. Most families tried to have their raw sewage collected and dumped in the Thames to prevent their cesspit from filling faster than the sewage could decompose into the soil. Thomas Shapter had conducted similar studies and used a point-based map for the study of cholera in Exeter, seven years before John Snow, although this did not identify the water supply problem that was later held responsible. Farr denied Snow's explanation of how exactly the contaminated water spread cholera, although he did accept that water had a role in the spread of the illness. In fact, some of the statistical data that Farr collected helped promote John Snow's views. In 2009, the John Snow lecture theatre was opened by HRH The Princess Royal at the London School of Hygiene & Tropical Medicine. In 2017 York Civic Trust erected a memorial to John Snow in the form of a pump with its handle removed, a blue plaque and an interpretation board, in North Street Gardens, York, close to his birthplace. ^ "John Snow". Encyclopædia Britannica. 8 March 2018. Retrieved 12 March 2018. ^ a b c d e f Ramsay, Michael A.E. (6 January 2009). "John Snow, MD: anaesthetist to the Queen of England and pioneer epidemiologist". Proceedings (Baylor University. Medical Center). 19 (1): 24–28. doi:10.1080/08998280.2006.11928120. PMC 1325279. PMID 16424928. ^ Ball, Laura (2009). 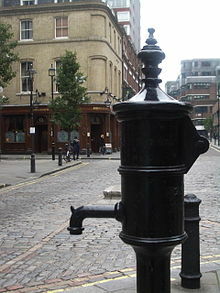 "Cholera and the Pump on Broad Street: The Life and Legacy of John Snow". ^ Thomas, KB. John Snow. In: Dictionary of Scientific Biography. Vol 12. New York, NY: Charles Scribner's Sons; 1973:502–503. ^ Greenhow, Thomas M. "Cholera from the east. A letter addressed to Mayor of Newcastle-upon-Tyne James Hodgson, Esq". E. Charnley, 1852. Retrieved 16 April 2019. ^ "London Epidemiology Society". UCLA. Retrieved 22 October 2012. ^ Frerichs, R. "London Epidemiological Society". Depatment of Epidemiological (UCLA). Retrieved 18 March 2019. ...dreadful scourge, the cholera ....Snow was q founding member of .....(Tucker's) stimulating words lead to a meeting on March 6, 1850 in Hanover Square, within walking distance of the Broad Street pump in the Soho region of London. It was here that the London Epidemiological Society was born. ^ Dunnigan, M. (2003). "Commentary: John Snow and alum-induced rickets from adulterated London bread: an overlooked contribution to metabolic bone disease". International Journal of Epidemiology. 32 (3): 340–1. doi:10.1093/ije/dyg160. PMID 12777415. ^ Snow, J. (1857). "On the Adulteration of Bread As a Cause of Rickets". The Lancet. 70 (1766): 4. doi:10.1016/S0140-6736(02)21130-7. ^ "Anesthesia and Queen Victoria". John Snow. Department of Epidemiology UCLA School of Public Health. Retrieved 21 August 2007. ^ a b Caton, Donald (January 2000). "John Snow's Practice of Obstetric Anesthesia". ^ a b Snow, John (1855). On the Mode of Communication of Cholera (2nd ed.). London: John Churchill. ^ Gunn, S. William A.; Masellis, Michele (23 October 2007). Concepts and Practice of Humanitarian Medicine. Springer. pp. 87–. ISBN 978-0-387-72264-1. ^ Klein, Gary. Seeing What Others Don't. p. 73. ^ Shapter, Thomas (1849). The History of the Cholera in Exeter in 1832. London: John Churchill. ^ Cadbury, Deborah (2003). Seven Wonders of the Industrial World. London and New York: Fourth Estate. pp. 189–192. ^ Eyler, John M. (April 1973). "William Farr on the Cholera: The Sanitarian's Disease Theory and the Statistician's Method". Journal of the History of Medicine. ^ "Pumphandle Lectures". johnsnowsociety.org. The John Snow Society. Retrieved 1 May 2017. ^ JOHN SNOW'S HOMES. UCLA Department of Epidemiology, 2014. Retrieved 6 June 2014. ^ "List of notable occupants". Brompton Cemetery. Archived from the original (HTTP) on 23 August 2006. Retrieved 21 August 2007. ^ Punt, Steve (12 May 2014). "Birmingham". The 3rd Degree. Season 3. Episode 6. Event occurs at 7:05. BBC Radio 4. Retrieved 1 December 2016. ^ "The College Crest". The Royal College of Anaesthetists. 2014. Retrieved 12 September 2014. ^ Couvrier R, Edwards G (July 1959). "John Snow and the Institute of France". Med Hist. 3 (3): 249–251. doi:10.1017/s0025727300024662. PMC 1034490. ^ Hempel, S. (2013). "John Snow". The Lancet. 381 (9874): 1269. doi:10.1016/S0140-6736(13)60830-2.